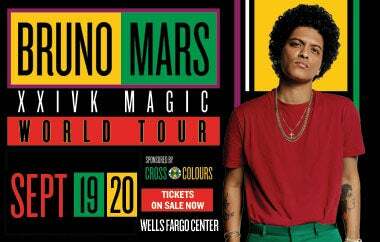 11x GRAMMY-winner and multi-platinum selling artist Bruno Mars has announced the last set of new dates that will be added to the 24K Magic World Tour with stops at Wells Fargo Center on Wednesday, September 19 and Thursday, September 20. The newly announced dates of the entertainment-packed tour will also feature Billboard chart topping “Finesse” collaborator Cardi B. Tickets go on sale on Friday, February 16 at 12 p.m. exclusively through WellsFargoCenterPhilly.com or by phone at 1-800-298-4200 or in person at the Wells Fargo Center box office.